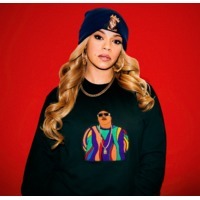 Next to her recording career, Evans is widely known as the widow of New York rapper Christopher "The Notorious B.I.G." Wallace, whom she married on August 4, 1994, three weeks after meeting at a Bad Boy photoshoot. The turbulent marriage led to Evans' involvement in the East Coast-West Coast hip hop feud, dominating the rap scene at the time, and ended with Wallace's murder in a yet-unsolved drive-by shooting in Los Angeles, California in March 1997. A 1997 tribute single featuring Puff Daddy and 112, entitled "I'll Be Missing You", became Evans' biggest-selling hit to date and won her a Grammy Award in 1998.